Although monolithic EMI filters initially cost more than equivalent ordinary capacitors, our customers tell us that their cost is a fraction of the cost of a common mode choke alone. Jeff Elliott | Johanson Dielectrics, Inc.
A multitude of factors are conspiring to increase the amount of “noise” interference that can disturb the functionality and even damage electronic devices, starting with the sheer number used in our vicinity at any given time. Today’s automobiles provide a prime example. In a single vehicle you can find Wi-Fi, Bluetooth, satellite radio, GPS systems, LED lights, air conditioning, power steering, anti-lock brakes, rear-view cameras and other instrumentation. Numerous items also operate using dc motors, including power seats, adjustable mirrors, windshield wipers, power windows and sunroofs. This same example could also apply to items ranging from Wi-Fi or Bluetooth-enabled appliances like washing machines, espresso machines, medical instruments and even medical implants. To accomplish this, the industry has typically employed shielding along with EMI filters in various configurations to eliminate unwanted noise. However, even some of the traditional solutions for eliminating EMI/RFI are no longer sufficient given increases in operating circuit frequency, noises of higher frequencies that expand the affected frequency range and the miniaturization of electronic devices that shrinks the distance between source and victim. If that wasn’t enough, many electronic devices are more easily affected by noise, even with less energy, due to circuits today that operate at lower voltages. This is leading many OEMs to avoid options such as 2-capacitor differential, 3-capacitor (one X-cap and 2 Y-caps), feed-through filters, common mode chokes or combinations of these for more ideal solutions such as monolithic EMI filters that deliver superior noise suppression in a substantially smaller package. When electronic devices receive strong electromagnetic waves, unwanted electric currents can be induced in the circuit and cause unintended operations – or interfere with intended operations. EMI/RFI can be in the form of conducted or radiated emissions. When EMI is conducted, it means the noise travels along the electrical conductors. Radiated EMI occurs when noise travels through the air as magnetic fields or radio waves. Even if the energy applied from the outside is small, if it is mixed with the radio waves used for broadcasting and communication, it can cause loss of reception, abnormal noise in sound, or disrupted video at places where the radio waves for broadcasting and communication are weak. If the energy is too powerful, electronic devices can be damaged. Sources of noise includes natural, such as electrostatic discharge, lighting and other sources; and artificial noise such as contact noise, leaking from devices that use high frequencies, unwanted emission (e.g. harmonic emission from digital circuit, emission from switching power supplies) and others. Noise can even be generated from a circuit inside an electronic device and cause interference with another circuit in the same electronic device. Usually, EMI/RFI noise is common mode noise, so the solution to all but eliminate unwanted high frequencies with an EMI filter, either as a separate device, or embedded in circuit boards. This also helps OEMs meet regulatory standards that exist in most countries that limit the amount of noise that can emitted. EMI filters normally consist of passive components, such as capacitors and inductors, connected together to form circuits. “The inductors allow dc or low frequency currents to pass through, while blocking the harmful unwanted high frequency currents. The capacitors provide a low impedance path to divert the high frequency noise away from the input of the filter, either back into the power supply or to the ground connection,” explains Christophe Cambrelin of Johanson Dielectrics, a company that manufactures a variety of multi-layer ceramic capacitors and EMI filters. Traditional common mode filtering approaches include low pass filters comprised of capacitors that pass signals with a frequency lower than a selected cutoff frequency and attenuates signals with frequencies higher than the cutoff frequency. A common starting point is to apply a pair of capacitors in a differential configuration, with one capacitor between each trace and ground of the differential input. The capacitive filter in each leg diverts EMI/RFI to ground above a specified cut-off frequency. Because this configuration involves sending a signal that is opposite in phase through two wires, the signal-to-noise ratio is improved while unwanted noise is sent to ground. Perhaps the most common solution and an alternative to low-pass filters is the common mode choke. A common mode choke is a 1:1 transformer where both windings act as both primary and secondary. In this approach, current through one winding induces an opposing current in the other winding. Unfortunately, common mode chokes are also large, heavy, expensive, and subject to vibration induced failure. Still, an ideal common mode choke with perfect matching and coupling between the windings is completely transparent to differential signals, and presents very high impedance to common mode noise. One disadvantage of common mode chokes is the limited frequency range due to parasitic capacitance. For a given core material, the higher the inductance used to obtain lower frequency filtering, the greater the number of turns required and consequent parasitic capacitance that defeats high frequency filtering. Mismatch between windings from mechanical manufacturing tolerance can cause mode conversion, where a percentage of the signal energy converts to common mode noise and vice-versa. This gives rise to electromagnetic compatibility and immunity issues. Mismatches also reduce the effective inductance in each leg. Common mode chokes do have a major advantage over other options when differential signals (to pass) operate in the same frequency range as the common mode noise that must be suppressed. With a common mode choke, the signal pass band can extend into the common mode reject band. Despite the popularity of common mode chokes, a better alternative may be monolithic EMI filters. When properly laid out, those multilayer ceramic components provide superior rejection of common mode noise. They combine two balanced shunt capacitors in a single package, with mutual inductance cancellation and shielding effect. These filters from Johanson Dielectrics utilize two separate electrical pathways within a single device attached to four external connections. To prevent confusion, it should be noted that a monolithic EMI filter is not a traditional feed-thru capacitor. Although they look identical (same package and external look), their design is very different and they are not connected in the same way. Like other EMI filters, monolithic EMI filters attenuate all energy above a specified cut-off frequency and only selecting to pass required signal energy while diverting unwanted noise to ‘ground’. The key, however, is the very low inductance and matched impedance. 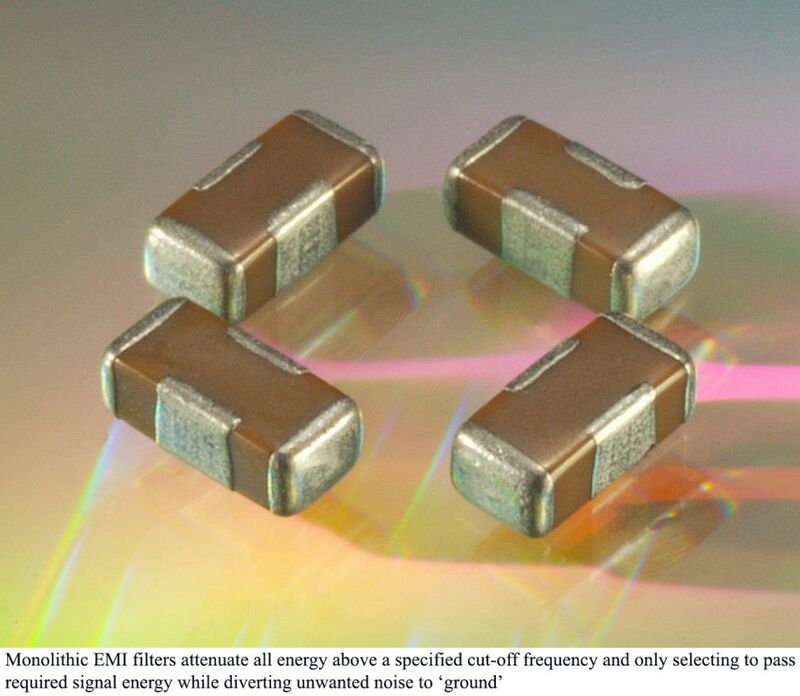 With monolithic EMI filters, the terminations connect internally to a common reference (shield) electrode within the device, and the plates are separated by the reference electrode. Electrostatically, the three electrical nodes are formed by two capacitive halves that share common reference electrodes all contained in a single ceramic body. “Being very well-balanced, a monolithic EMI filter introduces almost no conversion of common mode noise to differential signals, or vice-versa. Furthermore, having a very low inductance makes it particularly effective at high frequencies,” says Cambrelin. The balance between capacitor halves also means piezo-electric effects are equal and opposite, canceling out. This also affects temperature and voltage variation, so components age equally on both lines. “Compared to the common mode choke solution, this device provides significantly more RFI suppression in a substantially smaller package. It also rejects a much wider frequency band,” says Cambrelin. If there is a downside to these monolithic EMI filters, it is that they cannot be used if the common mode noise is at the same frequency as the differential signal. “When this is the case, the common mode choke is a better solution,” says Cambrelin.